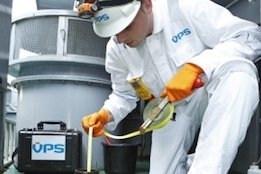 Veritas Petroleum Services (VPS) today announced the launch of a new Quick Screening Service for Mass Flow Meter (MFM) delivery of bunkers in Singapore. "The intention of this service is to provide a quick 'Pass / Fail' preliminary guide on the performance of the Mass Flow Meter, based on the meter profile and the field documents as obtained by the VPS Surveyor and assessed by the in-house VPS Flow Technologist," explained VPS. "This 'Pass / Fail' rating will form part of the Bunker Quantity Survey report, so the information can be received in a timely manner." The company notes that, if the Quick Screening evaluation shows a fail rating, then further tests will be carried out accordingly. Under the Quick Screening service, a meter profile evaluation will be completed to assess mass flow, air index, temperature, density, drive gain, and damping, among others, as well as Field Documents checks on calibration certificate, and zero verification report. "Mass Flow Meter operation is not 'Plug & Play' and dispute resolution will be complex if a set of procedures is not available to do a preliminary round of checks based on existing parameters," stated VPS.